It has been reported that up to one-fourth of the Taiwanese adolescent population experienced sleep disorders of which inadequate sleep is the most common. Stress from academic performance, peers, relationship with the opposite gender, materialistic needs, and family has been found to significantly contribute to sleep deprivation in adolescents, especially in females., Not only does inadequate sleep adversely affect physical health causing daytime somnolence and body weight gain, but it also has negative psychological and social impacts including impaired ability of concentration and emotional control, being prone to accidents as well as deteriorated academic performance and social relations., Those whose condition has not been adequately controlled may proceed to the development of drug abuse and obesity in adulthood.,,,, Previous studies have shown that an adequate sleep duration should be more than (including) 7 h.,, Adequate sleep has been found to be critical to the maintenance of health and the development of health-related behaviors in adolescents. In addition, females appear to have a higher sleep requirement compared to that in males in this age group. A body of evidence has demonstrated a link between insomnia and pubertal development in adolescent females, with the interesting discovery that the risk for insomnia was increased by 2.75 folds following the onset of menses., Not only has a negative correlation been shown between sleep duration and body mass index (BMI),, but reduced sleep duration has also been found to predispose to depression in adolescent females. Although previous studies in Taiwan focused on the impacts of external environments including the school, the family, and the society on sleep deprivation in adolescent females, the relation between health-related behaviors and sleep duration in this population has not been adequately addressed. The correlation between health-related behaviors and sleep has been previously established. A study on 656 teenagers of age between 13 and 18 years demonstrated better health-related behaviors including life appreciation, taking responsibility for health, adopting healthy diet, effective stress management, regular exercise, and total score on adolescent health promotion scale in those with sleep duration between 6 and 8 h compared to those without. However, that study did not specifically analyze the factors affecting sleep in adolescent females. Another study on 184 Taiwanese college students further revealed a positive association between sleep duration and stress management ability in adolescent females. Nevertheless, the impact of the use of a smartphone, which is undeniably common nowadays, on sleep has not been addressed in that study. Use of smartphone before sleep has been found to be a significant contributor to sleep deprivation in adolescent females. Excessive use of smartphone not only has negative impacts on physical health and wellness but also impairs sleep quality and duration. The flashing light of cell phone and the stimulus from its games have been reported to adversely affect sleep quality through prolonging sleep-onset latency and shortening rapid eye movement (REM) sleep. Smartphone dependence, which has become epidemic among adolescents, has been found to occur more often in females than in males., Hence, the impact of smartphone dependence on sleep in adolescent females is a growing health issue. Taking into account the importance of self-management in maintaining a healthy sleep pattern, it is anticipated that reinforcement of health-related behaviors may improve the situation of sleep deprivation in adolescent females. Of age between 15 and 20 years, female junior college students are at a critical stage of transition from adolescence to adulthood when the development of appropriate health-related behaviors would lay the foundation of a healthy lifestyle in adulthood., Therefore, the present study aimed at (1) investigating the relationships among health-related behaviors, smartphone dependence, and sleep duration as well as and (2) identifying the factors that affect sleep duration in female junior college students to provide information for parents, health-care professionals, and teachers to implement suitable health-promoting programs to meet the special needs of this population. In December 2014, female students from a single junior college in Southern Taiwan were enrolled for the present cross-sectional study. The inclusion criteria included (1) possession of her own smartphone for at least 6 months and (2) ability to communicate in Mandarin or Taiwanese verbally and complete a questionnaire in Chinese. Participants who were mothers to children, those participated in work with night shifts, those who failed to complete the questionnaire, and/or those consumed sedative hypnotics in the recent 6 months were excluded from the present study. The study was reviewed and approved by the Institutional Review Board of the National Cheng Kung University (No. 102-093, Tainan, Taiwan). Informed consents were obtained from all participants. In addition, for the purpose of the present study, adequate sleep was defined as a sleep duration of more than (including) 7 h.
All participants were required to complete a questionnaire comprising three parts: Part 1 encompassed demographic and anthropometric information (e.g., BMI) as well as habits of alcohol and tobacco consumption. The participant was also required to report the habit of using a smartphone before sleep and the sleep duration. Part 2 focused on assessing the degree of smartphone dependence. Based on the design of previous studies,, all participants were asked to respond to four questions with a point given to each on a five-point Likert scale. While score 1 represented strong disagreement, score 5 denoted strong agreement. The four questions were: (1) I feel anxious when my smartphone is not with me; (2) I usually browse on my smartphone without obvious purpose; (3) Checking messages on my smartphone (e.g., unanswered phone calls, text messages, and information from social media such as Facebook and LINE); and (4) I keep using my smartphone for receiving and/or sending information in class. The higher the score, the more severe the degree of smartphone dependence. Cronbach's alpha of the items was 0.76. Part 3 evaluated the participant's participation in health-related behaviors based on the Taiwanese version of the health-promoting lifestyle profile (HPLP). The HPLP, which was first developed by Walker et al. in 1987, has been translated into five languages and used in 15 countries. The number of questions was reduced to 40 in the Taiwanese version which has been shown to have a high sensitivity and specificity in the study of a participant's compliance with health-promoting lifestyle. It is a tool for self-assessment that measures six dimensions: (1) nutrition (5 items; e.g., regularity of three meals in a day), (2) health responsibility (8 items; e.g., knowledge of one's own blood pressure through measurement), (3) self-actualization (8 items; e.g., being confident and optimistic about life), (4) interpersonal support (6 items; e.g., being keen on making contacts with close friends or relatives), (5) exercise (4 items; e.g., performance of stretching exercises at least three times a week), and (6) stress management (9 items; e.g., being attentive to one's own negative emotions). Each item was rated by the participant according to a Likert 4-point scale (i.e., 0: never; 1: occasionally; 2: usually; and 3: always). The higher the score, the better the participant's compliance with health-promoting lifestyle. Cronbach's alpha was 0.95 for the total score of HPLP and ranged from 0.79 to 0.93 for the six dimensions of its items. SPSS for Mac version 22.0 (SPSS Inc., Chicago, IL, USA) was used for all statistical analyses. Average values were expressed as mean ± standard deviation. Using a cutoff point of 7 h, the testing participants were divided into those with adequate sleep (i.e., 7 h or more) and those without (i.e., <7 h). The demographic and anthropometric data as well as the scores on smartphone dependence and HPLP of the two groups were compared using Fisher's exact test and Student's t-test where appropriate. Logistic regression analysis was performed for studying the association of sleep adequacy (0: <7 h; 1: 7 h or more) with the scores on smartphone dependence and HPLP (i.e., total scores and those in the six dimensions) with control of variables including age, BMI, habits of alcohol, and tobacco consumption as well as the use of smartphone before sleep. Significant predictors affecting the duration of the sleep were then identified using stepwise regression with sleep duration being set as the dependent variable and scores on smartphone dependence as well as the total scores of HPLP and those in its six dimensions set as independent variables with control of variables including age, BMI, habits of alcohol, and tobacco consumption as well as the use of smartphone before sleep. Totally, 387 female junior college students were recruited for the present study. After the exclusion of two participants who failed to complete the questionnaire, 385 participants were eligible for this study. 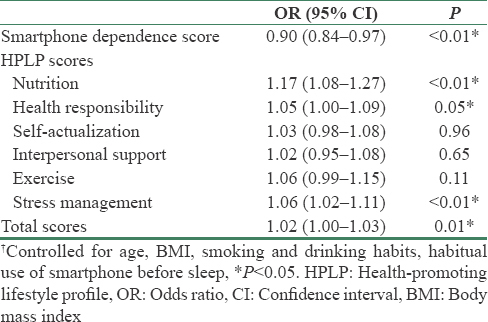 The demographic, anthropometric, and lifestyle characteristics as well as scores on smartphone dependence and the six dimensions of HPLP are shown in [Table 1]. The mean age of the participants was 17.50 ± 3.30 (range: 15–21) years. The mean sleep duration was 7.35 ± 1.49 h (range: 3–12). Up to 95% of participants were in the habit of using their smartphones before their sleep, but most participants (97%) did not have smoking or drinking habits. Analysis using Student's t-test and Fisher's exact test demonstrated that an increased smartphone dependence score was significantly associated with inadequate sleep (i.e., <7 h) (P < 0.01), while an absence of smoking habit correlated significantly with adequate sleep (i.e., 7 h or more) [Table 1]. In terms of HPLP, adequate sleep was significantly associated with high scores in the dimensions of nutrition (P < 0.01) and stress management (P = 0.01) as well as a high total score (P = 0.02). Logistic regression analysis revealed that smartphone dependence correlated negatively with sleep duration, whereas the dimensions of nutrition (P < 0.01), health responsibility (P < 0.05), and stress management (P < 0.01) as well as the total score (P = 0.01) of the HPLP were positively associated with the duration of sleep [Table 2]. Stepwise regression further demonstrated that smartphone dependence was the only significant predictor of sleep adequacy (B: −0.06; standard error: 0.02; P < 0.01). Factors affecting sleep have been extensively investigated. Medication and cognitive behavior therapy are the two major treatment strategies for sleep deprivation. Not only is medication known to be associated with undesirable side effects but it may also carry the risk of addiction. On the other hand, cognitive behavioral therapy requires an appointment with a psychotherapist and allocation of extra time out of one's routine schedule, causing stress and inconvenience. For adolescents, it has been reported that compliance with a health-promoting lifestyle through behavioral modifications is more effective than medication and cognitive behavioral therapy for the prevention and treatment of sleep deprivation. The results of the present study showed that not only was a health-promoting lifestyle positively associated with sleep duration but smartphone dependence was also a significant predictor of sleep deprivation in female junior college students. One of the interesting findings of the current study is that an absence of smoking habit was associated with longer sleep duration [Table 1]. Although the relationship between smoking habit and sleep duration has not been addressed in previous literature, night shift workers have been reported to use tobacco as a stimulant. Despite the exclusion of nigh shift workers from the present study, it is still possible that those who had a smoking habit tended to stay up later at night compared to the nonsmokers. Another intriguing finding is the negative association between smartphone dependence and sleep duration [Table 1]. The encroachment on normal sleeping time by the time that the participants spent with their smartphones may be at least partly explained the finding. Regarding the impact of health-promoting lifestyle on sleep duration, the current study showed that participants with adequate sleep scored significant higher than those without in the nutrition and stress management dimensions. Besides, the total HPLP score was also higher in the former than that in the latter [Table 1]. Consistently, logistic regression analysis of the present study further supported the positive associations of sleep duration with several dimensions of health-promoting lifestyle (i.e., nutrition, health responsibility, and stress management) as well as the total HPLP score. The most important finding of the current study is the negative impact of smartphone dependence on sleep duration [Table 2] and stepwise regression]. A recent large-scale study on 24,800 high-school students has demonstrated that the use of television and other screen devices over 5 h a day was significantly associated with inadequate sleep (odds ratio = 1.79, 95% confidence interval: 1.54–2.08), increased sugar-sweetened beverage intake, and inadequate physical activity. The findings of the present study support those of that investigation. Although the current study did not provide information on the duration of smartphone use of the participants, smartphone dependence may better reflect the impact of smartphone use on the lifestyle of adolescents which was shown to be an important determinant of sleep duration in the present study. Cell phone addiction is characterized by anxiety from the fear of losing access to one's phone or not having connectivity.,,, The behavioral features suggestive of cell phone dependence may include lack of confidence, low academic achievement, routine phone conversation at night, prolonged phone conversation, failure to observe school rules and regulations, engagement in activities unrelated to learning, and negligence of important matters that desire serious attention. The likelihood of smartphone addiction has been found to increase among adolescent females if they use their smartphones as a platform for social activities such as expressing and sharing their feelings. Therefore, in addition to fostering the habit of appropriate smartphone use among adolescents, the present study showed that inadequate sleep could be improved through the reinforcement of a health-promoting lifestyle including behavioral modifications to strengthen the dimensions of nutrition, health responsibility, and stress management [Table 2]. 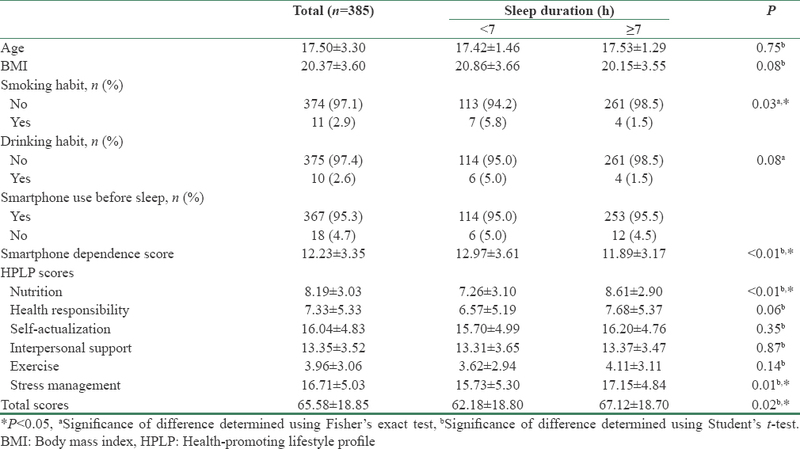 In terms of the impact of nutrition on sleep duration, the current study demonstrated a positive association between a high HPLP score in the nutrition dimension (e.g., consumption of food rich in fibers such as fruits and vegetables or daily water intake of 1500 mL) and sleep duration [Table 1] and [Table 2]. The findings were consistent with those of a previous study, and may be partly explained by the enhancement of sleep quality through dietary intake of Vitamins B and C as previously reported., Other investigations have further shown that those who had a short sleep duration tended to have a higher fat intake compared to those with a long sleep duration. The increased fat intake, in turn, would alter the normal sleep architecture through shortening the duration of REM sleep, thereby impairing both the quality and quantity of sleep.,,,, Other dietary products known to stimulate the central nervous system and contribute to insomnia also include theophylline, caffeine, and theobromine which are common ingredients of milk tea, coffee, and soft drinks (e.g., coke) that adolescents frequently consume. Regarding the finding of a positive correlation between the HPLP score in the health responsibility dimension and sleep duration [Table 2], one possible explanation could be a better capacity for self-control compared to that among the low scorers. A good ability of self-control can be reflected in one's perseverance to maintain a sleep hygiene and avoid the consumption of dietary products potentially detrimental to sleep (e.g., caffeine) at night. On the other hand, the finding of a positive association between the HPLP score in the stress management dimension and the sleep adequacy was in concert with that of a previous study showing a shortened sleep duration with accompanying negative emotions among adolescents subject to stress., The result of the current study suggests that, on top of the advice on stress management by teachers and parents, the adverse effect of stress on sleep in adolescents may be minimized by following the items included in the stress management dimension of the HPLP such as time allocation for relaxation on a daily basis, weight-watching, and reinforcement of health-related knowledge through reading health-promoting materials. The current study has its limitations. First, instead of using sophisticated devices for accurately measuring the duration of sleep (e.g., electronic bracelet), the parameter was obtained through a more subjective approach of self-reporting despite its common use in sleep-related research among adolescents. Second, all data were gathered from a single institute so that the findings may not be extrapolated to other tertiary education institutes. Finally, the cross-sectional nature of the present study cannot shed light on the casual relationship between smartphone uses and sleep duration. The results of the present questionnaire-based study showed that smartphone dependence was a significant predictor of inadequate sleep among adolescent females. On the other hand, positive associations of sleep duration with scores in the dimensions of nutrition, health responsibility, and stress management of the HPLP were noted. The findings highlight the importance of reinforcing a healthy lifestyle including prevention of smartphone dependence in maintaining healthy sleep habits in this population. Huang YS, Wang CH, Guilleminault C. An epidemiologic study of sleep problems among adolescents in North Taiwan. Sleep Med 2010;11:1035-42. Johnson EO, Roth T, Schultz L, Breslau N. Epidemiology of DSM-IV insomnia in adolescence: Lifetime prevalence, chronicity, and an emergent gender difference. Pediatrics 2006;117:e247-56. Lin LN, Chang YY, Ho HH, Yen LL. Sleep problems in adolescents. Formos J Med 2012;16:72-83. Imani V, Lin CY, Jalilolgadr S, Pakpour AH. Factor structure and psychometric properties of a persian translation of the epworth sleepiness scale for children and adolescents. Health Promot Perspect 2018;8:200-7. Lin CY, Strong C, Siu AM, Jalilolghadr S, Nilsen P, Broström A, et al. Validating the persian adolescent sleep hygiene scale-revised (ASHSr) using comprehensive psychometric testing methods. Sleep Med 2018;50:63-71. Ivanenko A, Crabtree VM, Gozal D. Sleep in children with psychiatric disorders. Pediatr Clin North Am 2004;51:51-68. Meltzer LJ, Mindell JA. Sleep and sleep disorders in children and adolescents. Psychiatr Clin North Am 2006;29:1059-76. Randazzo AC, Muehlbach MJ, Schweitzer PK, Walsh JK. Cognitive function following acute sleep restriction in children ages 10-14. Sleep 1998;21:861-8. Chen MY, Wang EK, Jeng YJ. Adequate sleep among adolescents is positively associated with health status and health-related behaviors. BMC Public Health 2006;6:59. Wheaton AG, Olsen EO, Miller GF, Croft JB. Sleep duration and injury-related risk behaviors among high school students – United States, 2007-2013. MMWR Morb Mortal Wkly Rep 2016;65:337-41. Kotchabhakdi N, Aimyong N, Kotchabhakdi N. S33. C adolescents' health and sleep problems in Thai urban and rural communities. Sleep Med 2007;8:S37. Hong CY, Chen LH. Association between sleep durtation, body mass index and depression symptoms in young girls. Natl Taichung Univ J Phys Educ 2012;7:21-8. Wang SH, Hong YW, Yeh YH. Investigating on factors affecting college students' sleep quality and physical and mental health. J Eng Technol Educ 2014;11:348-61. Lin PH, Lin CY, Wang PY, Yang SY. Association between sleeping duration and health-related behaviors in college student. Soc Health Behav 2018;1:31. Lemola S, Perkinson-Gloor N, Brand S, Dewald-Kaufmann JF, Grob A. Adolescents' electronic media use at night, sleep disturbance, and depressive symptoms in the smartphone age. J Youth Adolesc 2015;44:405-18. Xie X, Dong Y, Wang J. Sleep quality as a mediator of problematic smartphone use and clinical health symptoms. J Behav Addict 2018;7:466-72. Kenney EL, Gortmaker SL. United States adolescents' television, computer, videogame, smartphone, and tablet use: Associations with sugary drinks, sleep, physical activity, and obesity. J Pediatr 2017;182:144-9. Higuchi S, Motohashi Y, Liu Y, Maeda A. Effects of playing a computer game using a bright display on presleep physiological variables, sleep latency, slow wave sleep and REM sleep. J Sleep Res 2005;14:267-73. Randler C, Wolfgang L, Matt K, Demirhan E, Horzum MB, Beşoluk Ş, et al. Smartphone addiction proneness in relation to sleep and morningness-eveningness in german adolescents. J Behav Addict 2016;5:465-73. Yang SY, Lin CY, Huang YC, Chang JH. Gender differences in the association of smartphone use with the vitality and mental health of adolescent students. J Am Coll Health 2018;66:693-701. Hung LL, Kao SF. The self-efficacy and health-promoting lifestyles of the nursing students in a nursing institute. Chang Gung Nurs 1997;8:52-65. Tsai MC, Strong C, Lin CY. Effects of pubertal timing on deviant behaviors in taiwan: A longitudinal analysis of 7th- to 12th-grade adolescents. J Adolesc 2015;42:87-97. Tsai SC. A study on mobile phone use behavior and its connection with interpersonal relationship and parent-children interactions for junior high school students in Tainan. Forum Educ Res 2012;4:1-21. Yang SY, Chen MD, Huang YC, Lin CY, Chang JH. Association between smartphone use and musculoskeletal discomfort in adolescent students. J Community Health 2017;42:423-30. Walker SN, Sechrist KR, Pender NJ. The health-promoting lifestyle profile: Development and psychometric characteristics. Nurs Res 1987;36:76-81. Chen MY, Chou CC, Shiau HS, Wang EK, Chiou HJ, Liao JC. The development of Chinese version health promoting lifestyle profile. Chang Gung Nurs 1997;8:14-24. Faulkner S, Bee P. Perspectives on sleep, sleep problems, and their treatment, in people with serious mental illnesses: A systematic review. PLoS One 2016;11:e0163486. Longo LP, Johnson B. Addiction: Part I. Benzodiazepines – Side effects, abuse risk and alternatives. Am Fam Physician 2000;61:2121-8. Chang SR, Jiang YT, Xie GY, Chen QR, Song HY. Smoking behavior among female worker in semiconductor industry. Ind Saf Health 2006;200:36-45. Samaha M, Hawi NS. Relationships among smartphone addiction, stress, academic performance, and satisfaction with life. Comput Human Behav 2016;57:321-5. Lin CY, Griffiths MD, Pakpour AH. Psychometric evaluation of persian nomophobia questionnaire: Differential item functioning and measurement invariance across gender. J Behav Addict 2018;7:100-8. Lin CY, Imani V, Broström A, Nilsen P, Fung XC, Griffiths MD, et al. Smartphone application-based addiction among Iranian adolescents: A psychometric study. Int J Ment Health Addict 2018:1-16. Yam CW, Pakpour AH, Griffi ths MD, Yau WY, Lo CM, Ng JM, et al. Psychometric testing of three chinese online-related addictive behavior instruments among hong kong university students. Psychiatr Q 2018;1-12. Available from: https://doi.org/10.1007/s11126-018-9610-7. [Last accessed 10 Nov 2018]. Hong FY, Chiu SI, Huang DH. A model of the relationship between psychological characteristics, mobile phone addiction and use of mobile phones by Taiwanese university female students. Comput Human Behav 2012;28:2152-9. Choi SW, Kim DJ, Choi JS, Ahn H, Choi EJ, Song WY, et al. Comparison of risk and protective factors associated with smartphone addiction and internet addiction. J Behav Addict 2015;4:308-14. Li J. Higher Vitamin D intake could improve sleep and cognitive outcomes in older adults with heart failure. Evid Based Nurs 2018;21:69. Ongan D, Yuksel A. What to eat for a better sleep in haemodialysis patients: Potential role of B vitamins intake and appetite. Pak J Med Sci 2017;33:417-24. Shi Z, McEvoy M, Luu J, Attia J. Dietary fat and sleep duration in Chinese men and women. Int J Obes (Lond) 2008;32:1835-40. Weiss A, Xu F, Storfer-Isser A, Thomas A, Ievers-Landis CE, Redline S, et al. The association of sleep duration with adolescents' fat and carbohydrate consumption. Sleep 2010;33:1201-9. Chen SH, Tsai JC. Exercise, nutrition and sleep of adolescents. Changhua Norm Univ Sports J 2015;14:105-16. Kim K, Shin D, Jung GU, Lee D, Park SM. Association between sleep duration, fat mass, lean mass and obesity in Korean adults: The fourth and fifth Korea National Health and Nutrition Examination Surveys. J Sleep Res 2017;26:453-60. Hsu HT, Young KB, Hwang FM, Huang YS. A study of the relationship between living habits and sleep quality of fifth & sixth grade students at taipei elementary school. J Early Child Educ Care 2011;7:77-94. Chue AE, Gunthert KC, Kim RW, Alfano CA, Ruggiero AR. The role of sleep in adolescents' daily stress recovery: Negative affect spillover and positive affect bounce-back effects. J Adolesc 2018;66:101-11. Chiang JJ, Kim JJ, Almeida DM, Bower JE, Dahl RE, Irwin MR, et al. Sleep efficiency modulates associations between family stress and adolescent depressive symptoms and negative affect. J Adolesc Health 2017;61:501-7. Twenge JM, Krizan Z, Hisler G. Decreases in self-reported sleep duration among U.S. Adolescents 2009-2015 and association with new media screen time. Sleep Med 2017;39:47-53.